Do I Really Need to Read? I recently met the well-known M.D. 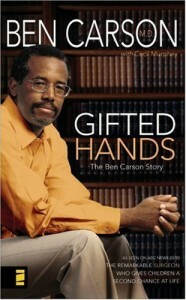 Ben Carson, a pediatric neurosurgeon at Johns Hopkins, and his story is of great inspiration. Ben Carson grew up in a poor area of Detroit, Michigan. His father left his family and the odds of him “becoming something” were low. As a young child he performed poorly in school and was bothered by classmates poking fun at him when grades were announced. Luckily, his mother with her third grade education was wise enough to realize that the answer to getting out of his aimless life was to start reading. She challenged Ben and his brother to read two books a week and limited them to three TV programs over the same time span. At the end of the week, they would turn in book reports about what they learned and their Mom would review them. Reading at an early age changed Ben from a D student to an A student. Interestingly enough, Ben would learn years later that his mom was actually illiterate and could not actually read the reports they wrote. She was determined for them to earn what she never had. Ben learned at an early age a few key lessons about reading. You always have time to read. You just might need to cut out some of the entertainment we all enjoy. Reading is an opportunity almost everyone has. Don’t take it for granted. Reading can transform the direction of anyone’s life. It may matter more than where you come from or who you meet. After reading got Ben on a good track in his education and life, he began to find learning new things enjoyable. He talks of how he enjoyed watching a collegiate quiz bowl as one of his three TV programs per week and tried to answer questions before the contestants could. He began learning more about art and classical music and even joked with his friends that the nickname for Detroit, “Motown”, had nothing to do with motors but actually dated back to Mozart. All this enjoyment of learning paid off big time. Years later when he was interviewing to get one of two spots in neurosurgery at Johns Hopkins the conversation drifted to interests and hobbies. The interviewer was a big fan of classical music and Carson’s knowledge and enjoyment of the art made the interview a fun one and ended up landing him the opportunity of a life time. Ben benefited from reading in a number of ways. Reading expands your breadth of knowledge and allows you to relate to many different types of people. Reading prepares you for a number of unknown opportunities down the road. Reading provides a break from the struggles of life and allows you to dream of better places. Now that Ben Carson has enjoyed a career of his dreams and has changed numerous lives, he is taking time to give back to others who find themselves in difficult situations. Carson now travels around the country in his free time (he only does a few hundred surgeries a year) and tries to spread the word on reading as a tool to help anyone become great. His charity Carson Scholars promotes his concept of THINK BIG and reading often. Ben understands that reading is a lifetime tool. Ben says the brain can easily hold all the information we could ever read so don’t stop. Ben says to keep learning and reading in all stages of life. What are your thoughts on reading? I didn’t grow up as a big reader but I have slowly started making it a larger part of how I spend my time. I have had to give up some other activities like TV and perusing Google News, but at the end of the day I always find myself a little happier and more focused on my goals. cool story and great post. loved the read. if you haven’t already, check out the movie “Something the Lord made” (http://www.imdb.com/title/tt0386792/)… about his story. great film.